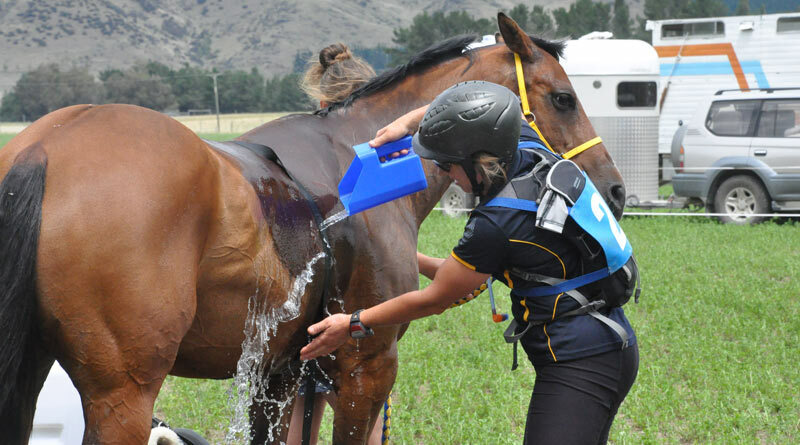 Cooling down your horse after exercise is critical to the animal’s wellbeing. Here are some crucial techniques to ensure everything runs smoothly. Horses are particularly good at two things. They’re great at digesting grass and can turn on an athletic performance that makes humans look like plodders. But they can’t do both at once. When a horse cranks up a gear or two, its digestive system all but shuts down. That’s because the blood that normally delivers oxygen and fuel to power the gut is diverted to the horse’s big muscles to power locomotion. The same happens in people, but the size and athletic nature of horses means the process happens on a much more industrial scale. That means cooling down properly is essential to a horse’s health and wellbeing. Failing to do so properly can potentially mean damaged muscles, laminitis, and even colic. Before examining the cooling process, it’s important to understand the physiological processes going on inside an exercising horse. As the horse’s big muscles move into gear, they demand more fuel for energy, and the oxygen needed to burn it. This is delivered by the blood. Blood vessels dilate to carry more blood and the animal’s heart rate increases to push more blood around the body. However, the blood vessels serving the digestive system contract, reducing flow to the gut and effectively shutting down digestion. The heart also pumps more blood with each beat. The demand for oxygen increases markedly, and the horse begins to breath faster and harder. Its nostrils flare to improve airflow into and out of the lungs. Heat: It seems remarkable, but only a quarter of the energy produced by the horse will go into locomotion. The rest will be lost as heat. Carbon dioxide: This is a byproduct produced by the muscles burning fuel, which is carried away by the blood to the lungs, where it is exhaled. Assorted other waste byproducts, also carried away by the blood to be filtered out by the kidneys and later expelled in the urine. So how does the horse cope with the heat? It’s a major issue because the muscles are huge and doing a lot of work. Heart and respiratory rates should be monitored to assess just how hot the horse is. For a start, the horse will be able to dispose of much of the heat through the lungs. Blood which has given its all to the muscles is returned to the heart and pumps on to the lungs, where it disposes of its carbon dioxide, recharges with oxygen, and offloads some of that heat. Suitably recharged, it returns to the heart where a second pair of chambers fire it back around the body. For some animals, such as dogs and cats, this is enough to keep them cool. For horses and people, it doesn’t cut the mustard. The heat continues to build and the brain’s hypothalamus, monitoring the situation, issues a crucial command. It orders the fine capillaries near the surface of the skin to dilate. This enables overheated blood to circulate close to the skin, where it can shed some of its heat. Depending on the amount of exercise and the air temperature, this may be enough to keep the horse cool. But if the heat continues to build, the hypothalamus has another trick up its sleeve. It orders the sweat glands into action. Sweat oozes into the horse’s coat. As it evaporates off the skin, it takes heat with it. This sweating costs your horse valuable electrolytes and thickens the blood. This thicker blood is harder to pump around the body, but is able to carry more oxygen to the muscles. By now, your horse has rolled out its full arsenal in its bid to stay cool and keep working. Failure to keep the moving after strenuous exercise can result in blood pooling in the dilated blood vessels of the animal’s legs. Its fitness, fluid loss and the ambient air temperature will all now play a part in determining just how much work your horse can handle. When you stop exercising, the signs of this integrated cooling system will be clear for all to see. The horse will be breathing hard and its nostrils flared. It’s pulse will be high and its skin soaked in sweat. You will see bigger blood vessels standing out underneath his or her skin. The work may be done, but the horse still has a lot of work to do in cooling down those big muscle groups, and returning to the state of equilibrium. The first thing you need to assess is how hot the horse really is. The amount of sweat is not a reliable indicator, as the rate of evaporation off the skin and coat can vary dramatically, depending upon the humidity and heat of the day. A more reliable indicator is to monitor the heart and breathing rates. Before we look at this, it’s important to keep the horse moving, leading it at a walk. This keeps the blood circulating through the muscles and skin to help along the cooling process. The muscles relaxing and contracting while walking also help push blood through the vessels. Failure to keep the animal moving can result in blood pooling in the dilated blood vessels of the animal’s legs. The circulating blood is also removing waste products from the muscles, which will help their recovery. If there’s a cooling breeze, use it. If you can walk your horse in the shade, head for it. As we’re walking, we want to get a handle on the horse’s heart and respiration rates. A horse’s normal respiration rate will range between eight and 16 breaths a minute. You can monitor this easily by watching the horse’s flank. Count the breaths for 15 seconds and multiply by four. At first, the animal will be taking big deep breaths to replenish the blood with oxygen. However, once oxygen levels in the blood have stablised, the horse is likely to take shallower breaths, possibly with an even faster respiration rate. This shallower breathing is a more efficient way for the horse to get cooler fresh air into and out of the lungs, taking away excess heat with it. The next piece of information you need is the horse’s pulse. The easiest place to get this is on the arteries that run either side underneath and inside the lower jaw bone. Using three fingers, press inwards and upwards, and you should detect the pulse. Again, count for 15 seconds and multiply by four. A horse’s resting pulse is likely to be between 30 and 40 beats a minute. Straight after exercising it’s almost certainly to be above 140 and may even be nudging 200 beats a minute. As a general rule, you know your horse has got some serious heart onboard if its respiration rate is faster than the pulse rate. Both should drop rapidly a few minutes after the end of exercise, but the higher respiration rate remains a good indicator of a serious heat problem. Some horse owners take their animal’s temperature with a rectal thermometer. A horse’s temperature will normally range between 37deg C and 38deg during the morning, a half to one degree warmer in the afternoon. It may be higher still during warm weather and foals will be a little higher again. In Fahrenheit, that’s 98.6deg to 100.4deg. After hard exercise, the rectal temperature could be around 40deg C (103-104deg F). Above that, and your horse is seriously overheated. Opinions vary among horse owners as to when the saddle should come off. Some feel the cool air hitting where a saddle once sat will cause the blood vessels to contract. Others point out that the vessels are dilated because the horse is wanting to cool down, so removing a saddle shouldn’t make any difference. As a general rule, it shouldn’t present any problems getting the saddle off quickly on a warm day. On a cooler winter’s day, let the horse cool a little before removing it. In winter, you may want to put a light rug on the horse once it’s shed the bulk of its heat to ensure the rest of its cooling doesn’t progress too rapidly. On a warm summer’s day, this shouldn’t be necessary. You can help cool your horse by sponging or hosing. This takes the place of sweat and is a very effective way to helping your horse shed body heat. Like sweat, it takes the heat away as it either falls on the ground or evaporates away. Opinions again vary on the best way to do this. Some only hose or sponge their hot horse around the neck, head and chest, as well as cleaning up the sweat between the hind legs. This is probably fine in moderate temperatures in any case. However, if conditions are hot, an all-over sponge bath or gentle spraying is probably wiser. Those who speak against it, argue that cold water will cause the blood vessels beneath the skin to contract, reducing the cooling effect. However, it’s important to realise that this cooling process is driven not by the skin, but by the brain’s orders to get the core body temperature down. Opinions differ on whether the water should be cold or tepid. Some argue that cold water on hot skin can trigger cramps. However, the reality is that tepid water on a hot day is not likely to help the horse’s cooling much. There is no doubt that the use of cold water on a hot day will greatly increase the rate at which the horse can shed heat. Bracing temperature or not, that’s what the horse is wanting to do. How you tackle sponging or spraying should ultimately depend upon the temperature on the day. On a very hot day, you want to disperse the heat as fast as you reasonably can. That could call upon an all-over application of cooler water. The balance of opinion now appears in favour of cold-water cooling in hot conditions, even to the extent of the addition of ice. It has been used at the highest levels of equestrian sport, although some still argue it carries the risking of tying up, although there is little or no evidence to support the assertion. The general view is that the quick cooling of horses in hot weather significantly reduces the risk of heat stress and the animals will recover quicker. The water should be applied all over, with a focus on the big muscle groups, which are likely to be holding the most heat. The pros use two people with buckets of water and sponges, applying the water to each side. They normally do so for only 30 seconds or so, before allowing the horse to continue walking off the heat. Some prefer to scrape off excess water before the next application, but most agree that the most important thing is to keep applying water. Don’t use bags of ice. The extreme cold may well construct bloodflow in the immediate area and, if kept on long enough, is liable to cause pain or discomfort. Placing cold, wet towels over rump or neck is now largely discredited as an efficient means of cooling. The problem is that the towel and water quickly warm up, at which time it is actually hindering the cool process. You’re best to keep applying cool water. The application of water has another added benefit. It will stop the animal’s sweating quicker, meaning it will end up less dehydrated. After you’ve walked your horse for a few minutes, you can stop briefly for a quick sponge bath or spraying. But then keep moving again. It’s crucial to the horse warming down properly. If you have a helper, perhaps they can use a bucket and sponge to cool the horse as you walk. Respiration and heart rates returning to close to normal are a clear sign your horse has just about cooled down. The other big issue to consider is food and drink. Your horse will understandably be thirsty and will have lost a lot of body salts (electrolytes), too. The horse must replace lost fluid, but it needs to be done a little at a time and often. A big, cold drink of water straight after exercise could well spell trouble for your horse. Bear in mind that its digestive system will have largely shut down during exercise. The last thing its stomach needs is a big, cold delivery of water. Too much water could trigger colic. It may also cause muscle cramps if the horse diverts blood back to the digestive system to handle the water. Laminitis is a further risk through mechanisms not yet fully understood. Naturally, you wouldn’t want to deprive your horse of water. It’s only sensible to allow the horse to start replacing lost fluid. However, it needs to be done a little at a time and often. As the animal cools it is better placed to divert blood back to the gut, and handle the water intake. Until that’s the case, a lot of water can prove dangerous. Your horse will benefit from dissolved electrolytes, too. However, always have plain water available, too, as it may quickly tire of the former and reject it. The same rules and reasoning behind limiting water apply to food. A few mouthfuls of grass or hay would be fine, but you don’t want the gut firing up until the animal has dealt with its excess heat. When exercised intensely in hot, humid weather, a horse may lose up to four gallons of sweat per hour. Cooling a horse can take anywhere from 15 minutes to an hour or more. A gentle rub of his muscles will help with circulation and ease any residual tightness. Don’t return the horse to its paddock with a water trough until you’re satisfied the animal has rehydrated to your satisfaction. Check on the horse 15 to 20 minutes after you’re satisfied he’s cooled down sufficiently. If he’s sweating again, get him walking again. The sweating is likely to have resulted from some residual heat in the muscles. You can check your horse’s hydration by pinching up 1cm or so of skin and releasing it. If it doesn’t fall back into place instantly, there’s a chance you horse remains dehydrated. Riders can apply a few other practical measures that are likely to make things easier for their horse. Where possible, transport your horse to the venue early, before the heat of the day. Horse boxes and floats can get very hot. The last thing you want to do is arrive with a horse that’s already sweaty and hot. Allow your horse to drink until 30 minutes before the start of the event. Any ingested water will not stay in the stomach long. Be sure to give you horse plenty of opportunities to drink if it doesn’t have ready access to a supply. And remember, if it’s hot, you horse should need a shorter warm-up before competition.